The search for parking is a leading cause of congestion in cities around the world. San Diego offered multiple public and private parking options, but people did not know how to access them. 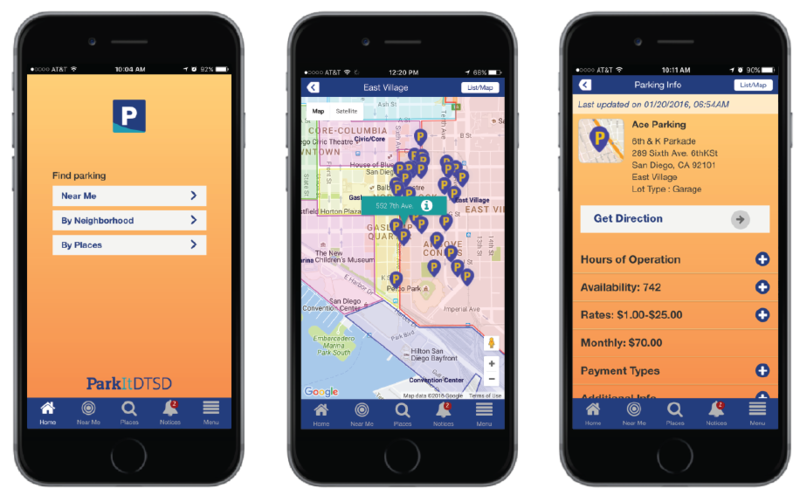 To promote tourism, economic development and mobility throughout Downtown San Diego, Civic San Diego found that it was necessary to provide a tool to simplify parking for residents, workers and visitors. CivicConnect was implemented specifically to ingest, manage and showcase parking assets and data. However, this was more than a standalone parking app for San Diego. The product seamlessly integrates multiple vendor parking APIs and public and private real-time parking data. This enables users to easily obtain on and off-street parking availability and general parking information in one location-based application. It also features alerts to allow Civic San Diego to communicate with users about event parking, road closures and more. Enabled by the CivicConnect® Platform, the application will integrate other urban mobility components in future phases. CivicConnect and CivicSD implemented ParkIt DTSD collaboratively with Downtown organizations including the Little Italy Association, East Village Association and Gaslamp Quarter Association, and the major parking operators resulting in a true community parking initiative. Those visiting, living and working in Downtown San Diego now have a resource to find parking anytime, anywhere. The parking search is no longer a deterrent for going out and exploring new areas. San Diego has future plans with CivicConnect that include augmented reality wayfinding and tourism elements that continue to provide a valuable experience for users even after they’ve parked their car.